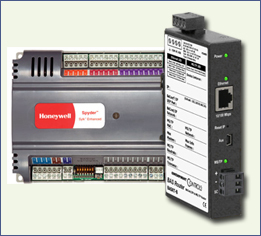 January 2013 - The BASrouter provides a simple, cost-effective method to attach Honeywell Spyder BACnet MS/TP controllers to BACnet/IP without the need of a building controller. This allows Spyders to reside on the building's Ethernet network without the need to provide home-run fieldbus wiring to a head-end. Spyder controllers are frequently used for both VAV and unitary applications. Originally available as a LON device, they are also available as a BACnet MS/TP device and therefore can be easily integrated to BACnet/IP with the popular BASrouter. Contemporary Controls has recently published an application note to explain how this is accomplished. Installing and operating the BASrouter (BASRT-B, 35 mm DIN-rail mount) with several Honeywell Spyder controllers is simple and straightforward. Configuration of the BASrouter is accomplished through web pages. Once the BASrouter is properly installed and configured, all the connected Spyder controllers can be accessible from any BACnet/IP client device. BACnet MS/TP data from the Spyder controllers are carried over a two-wire non-isolated twisted-pair network. Spyder controllers auto-baud. They wait until a head-end device - usually a building controller - to send out frames so connected controllers can "wake-up" and set their speed to that of the building controller. The BASrouter takes the place of the building controller so its data rate must be set during configuration thereby allowing the Spyder controllers to automatically match their data rate with that of the BASrouter. In addition, the BASrouter supports three-way routing between BACnet/IP, BACnet Ethernet and BACnet MS/TP. Any two or all three protocols can be routed, thereby allowing the system integrator to mix BACnet network technologies within a single BACnet internetwork. As an aid to troubleshooting, a diagnostic page will display the number of messages received and sent for each of the protocols supported.